Home to 11 unique communities, Moore County offers a place that’s perfect for raising a family without sacrificing career aspirations. 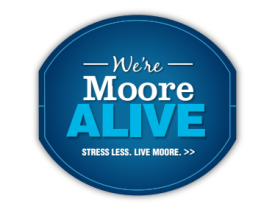 New Media Campaigns, together with agency partner Liaison Design Group, is proud to announce the launch of Moore Alive, a marketing and talent recruitment initiative to promote the local assets, amenities and quality of life in Moore County, NC. Moore County, a rural 'micropolitan' located 60 miles south of Raleigh, NC, is made up of 11 distinct communities including Pinehurst and Southern Pines. The area is already known as the “Home of American Golf®” and has a reputation as a popular retirement destination. The goal of Moore Alive is to show that golf is only one facet of the growing community, and promote the multitude of opportunities available in the area for people of all ages. The Moore Alive initiative, spearheaded by the economic development organization Moore County Partners in Progress, needed a strong online presence as its foundation to target and encourage individuals and families within a variety of demographic profiles to relocate to Moore County to live, work and play. NMC and Liaison are also working with Moore County PIP to develop and post content for the Moore Alive website. These posts range from information about what to do in Pinehurst doing the U.S. Opens to ways you can help Moore County military families to profiles on residents. "There are a variety of existing websites that market different aspects of Moore County, but until Moore Alive, we didn't have a site devoted to fully conveying just how exceptional the lifestyle and amenities are in Moore County," says Caleb Miles, President of the Pinehurst, Southern Pines and Aberdeen Area Convention and Visitors Bureau.